In addition to offering beautiful terrazzo flooring, The Venice Art Terrazzo Company has also perfected the art of terrazzo counter tops. These counter tops are custom made and hand crafted to various specifications. 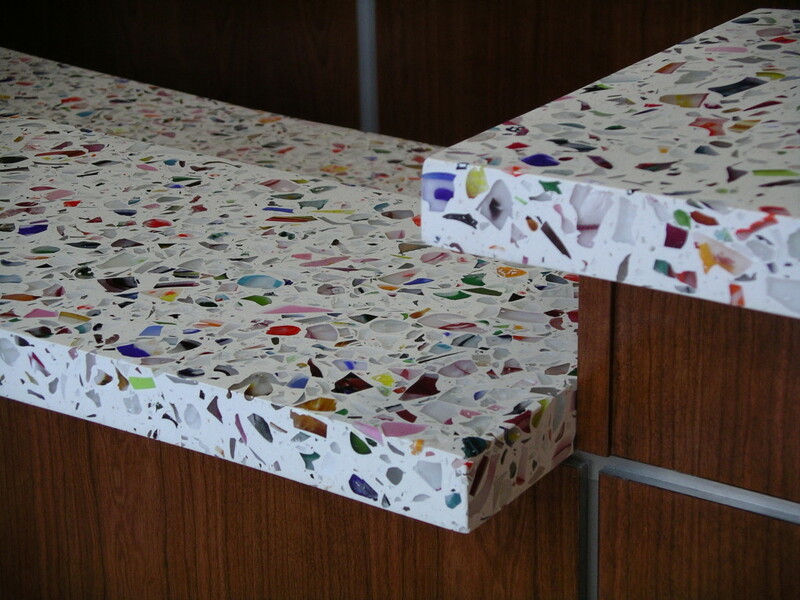 Choose from a large variety of colored resin or marble aggregate blends. This allows you to create your own unique one of a kind counter top. Besides the large selection of marble aggregates available, you may also choose to incorporate glass, mirror, or mother of pearl in your selected mix. Many of these glass products are sourced from either post industrial or post consumer recycled materials. If choosing a countertop that will require a sink (provided by owner) you have the option to choose between an under mount sink, drop in sink, and the additional option of a backsplash.